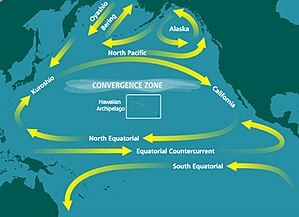 The area of increased plastic particles is located within the North Pacific Gyre, one of the five major ocean gyres. The Great Pacific garbage patch, also described as the Pacific trash vortex, is a gyre of marine debris particles in the north central Pacific Ocean. It is located roughly from 135°W to 155°W and 35°N to 42°N. The collection of plastic and floating trash, which comes primarily from countries in Asia, lies halfway between Hawaii and California and extends over an indeterminate area of widely varying range, depending on the degree of plastic concentration used to define it. The patch is characterized by exceptionally high relative pelagic concentrations of plastic, chemical sludge, and other debris that have been trapped by the currents of the North Pacific Gyre. Despite the common public image of islands of floating rubbish, its low density (4 particles per cubic meter) prevents detection by satellite imagery, or even by casual boaters or divers in the area. It consists primarily of an increase in suspended, often microscopic, particles in the upper water column. The patch is not easily seen from the sky, because the plastic is dispersed over a large area. Researchers from The Ocean Cleanup project claimed that the patch covers 1.6 million square kilometers. The plastic concentration is estimated to be up to 100 kilograms per square kilometer in the center, going down to 10 kilograms per square kilometer in the outer parts of the patch. An estimated 80,000 metric tons of plastic inhabit the patch, totaling 1.8 trillion pieces. 92% of the mass in the patch comes from objects larger than 0.5 centimeters. Research indicates that the patch is rapidly accumulating. A similar patch of floating plastic debris is found in the Atlantic Ocean, called the North Atlantic garbage patch. The patch is created in the gyre of the North Pacific Subtropical Convergence Zone. The patch was described in a 1988 paper published by the National Oceanic and Atmospheric Administration (NOAA). The description was based on research by several Alaska-based researchers in 1988 who measured neustonic plastic in the North Pacific Ocean. Researchers found relatively high concentrations of marine debris accumulating in regions governed by ocean currents. Extrapolating from findings in the Sea of Korea, the researchers hypothesized that similar conditions would occur in other parts of the Pacific where prevailing currents were favorable to the creation of relatively stable waters. They specifically indicated the North Pacific Gyre. Charles J. Moore, returning home through the North Pacific Gyre after competing in the Transpacific Yacht Race in 1997, claimed to have come upon an enormous stretch of floating debris. Moore alerted the oceanographer Curtis Ebbesmeyer, who subsequently dubbed the region the "Eastern Garbage Patch" (EGP). The area is frequently featured in media reports as an exceptional example of marine pollution. The JUNK Raft Project was a 2008 trans-Pacific sailing voyage made to highlight the plastic in the patch, organized by the Algalita Marine Research Foundation. In 2009, two project vessels from Project Kaisei, the New Horizon and the Kaisei, embarked on a voyage to research the patch and determine the feasibility of commercial scale collection and recycling. The 2009 SEAPLEX expedition also researched the patch. Researchers were also looking at the impact of plastic on mesopelagic fish, such as lanternfish. At TEDxDelft2012, Boyan Slat unveiled a concept for removing large amounts of marine debris from oceanic gyres. Calling his project The Ocean Cleanup, he proposed to use surface currents to let debris drift to collection platforms. Operating costs would be relatively modest and the operation would be so efficient that it might even be profitable. The concept makes use of floating booms that divert rather than catch the debris. This avoids bycatch, while collecting even the smallest particles. According to Slat's calculations, a gyre could be cleaned up in five years' time, amounting to at least 7.25 million tons of plastic across all gyres. He also advocated "radical plastic pollution prevention methods" to prevent gyres from reforming. In 2015, The Ocean Cleanup project was a category winner in the Design Museum's 2015 Designs of the Year awards. A fleet of 30 vessels, including a 32-metre (105-foot) mothership, took part in a month-long voyage to determine how much plastic is present using trawls and aerial surveys. The 2012 Algalita/5 Gyres Asia Pacific Expedition began in the Marshall Islands on 1 May, investigated the patch, collecting samples for the 5 Gyres Institute, Algalita Marine Research Foundation and several other institutions, including NOAA, Scripps, IPRC and Woods Hole Oceanographic Institute. In 2012, the Sea Education Association (SEA) conducted research expeditions in the gyre. 118 net tows were conducted and nearly 70,000 pieces of plastic were counted. In 2012, researchers Goldstein, Rosenberg and Cheng found that microplastic concentrations in the gyre had increased by two orders of magnitude in the prior four decades. On 11 April 2013, artist Maria Cristina Finucci founded The Garbage Patch State at UNESCO—Paris in front of Director General Irina Bokova. In 2015, a study published in the journal Science sought to discover where exactly all of this garbage is coming from. According to the researchers, the discarded plastics and other debris floats eastward out of countries in Asia from six primary sources: China, Indonesia, the Philippines, Vietnam, Sri Lanka and Thailand. On 9 September 2018, the first collection system was deployed to the gyre to begin the collection task. This initial trial run of the Ocean Cleanup Project started towing its "Ocean Cleanup System 001" from San Francisco to a trial site some 240 nautical miles (260 miles) away. The Great Pacific garbage patch formed gradually as a result of ocean or marine pollution gathered by ocean currents. It occupies a relatively stationary region of the North Pacific Ocean bounded by the North Pacific Gyre in the horse latitudes. The gyre's rotational pattern draws in waste material from across the North Pacific, including coastal waters off North America and Japan. As material is captured in the currents, wind-driven surface currents gradually move debris toward the center, trapping it. No strong scientific data concerning the origins of pelagic plastics exists. [dubious – discuss] In a 2014 study researchers sampled 1571 locations throughout the world's oceans, and determined that discarded fishing gear such as buoys, lines and nets accounted for more than 60% of the mass of plastic marine debris. According to a 2011 EPA report, "The primary source of marine debris is the improper waste disposal or management of trash and manufacturing products, including plastics (e.g., littering, illegal dumping) ... Debris is generated on land at marinas, ports, rivers, harbors, docks, and storm drains. Debris is generated at sea from fishing vessels, stationary platforms, and cargo ships." Constituents range in size from miles-long abandoned fishing nets to micro-pellets used in cosmetics and abrasive cleaners. 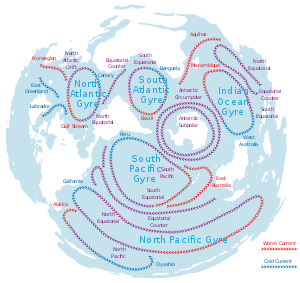 Currents carry debris from the west coast of North America to the gyre in about six years, and from the east coast of Asia in a year or less. A 2017 study concluded that of the 9.1 billion tons of plastic produced since 1950, close to 7 billion tons are no longer in use. The authors estimate that 9% was recycled, 12% was incinerated, and the remaining 5.5 billion tons remains in the oceans and land. Visualisation showing how mass accumulates in gyres. The size of the patch is indefinite, as is the precise distribution of debris, because large items are uncommon. Most debris consists of small plastic particles suspended at or just below the surface, evading detection by aircraft or satellite. Instead, the size of the patch is determined by sampling. Estimates of size range from 700,000 square kilometres (270,000 sq mi) (about the size of Texas) to more than 15,000,000 square kilometres (5,800,000 sq mi) (about the size of Russia). Such estimates, however, are conjectural given the complexities of sampling and the need to assess findings against other areas. Further, although the size of the patch is determined by a higher-than-normal degree of concentration of pelagic debris, there is no standard for determining the boundary between "normal" and "elevated" levels of pollutants to provide a firm estimate of the affected area. Net-based surveys are less subjective than direct observations but are limited regarding the area that can be sampled (net apertures 1–2 m and ships typically have to slow down to deploy nets, requiring dedicated ship's time). The plastic debris sampled is determined by net mesh size, with similar mesh sizes required to make meaningful comparisons among studies. Floating debris typically is sampled with a neuston or manta trawl net lined with 0.33 mm mesh. Given the very high level of spatial clumping in marine litter, large numbers of net tows are required to adequately characterize the average abundance of litter at sea. Long-term changes in plastic meso-litter have been reported using surface net tows: in the North Pacific Subtropical Gyre in 1999, plastic abundance was 335,000 items/km2 and 5.1 kg/km2, roughly an order of magnitude greater than samples collected in the 1980s. Similar dramatic increases in plastic debris have been reported off Japan. However, caution is needed in interpreting such findings, because of the problems of extreme spatial heterogeneity, and the need to compare samples from equivalent water masses, which is to say that, if an examination of the same parcel of water a week apart is conducted, an order of magnitude change in plastic concentration could be observed. In August 2009, the Scripps Institution of Oceanography/Project Kaisei SEAPLEX survey mission of the Gyre found that plastic debris was present in 100 consecutive samples taken at varying depths and net sizes along a path of 1,700 miles (2,700 km) through the patch. The survey found that, although the patch contains large pieces, it is on the whole made up of smaller items that increase in concentration toward the gyre's centre, and these 'confetti-like' pieces that are visible just beneath the surface suggests the affected area may be much smaller. 2009 data collected from Pacific albatross populations suggest the presence of two distinct debris zones. In March 2018, The Ocean Cleanup published a paper summarizing their findings from the Mega- (2015) and Aerial Expedition (2016). In 2015, the organization crossed the Great Pacific garbage patch with 30 vessels, to make observations and take samples with 652 survey nets. They collected a total of 1.2 million pieces, which they counted and categorized into their respective size classes. In order to also account for the larger, but more rare larger debris, they also overflew the patch in 2016 with a C-130 Hercules aircraft, equipped with LiDAR sensors. The findings from the two expeditions, found that the patch covers 1.6 million square kilometers with a concentration of 10–100 kg per square kilometer. They estimate an 80,000 metric tons in the patch, with 1.8 trillion plastic pieces, out of which 92% of the mass is to be found in objects larger than 0.5 centimeters. While "Great Pacific Garbage Patch" is a term often used by the media, it does not paint an accurate picture of the marine debris problem in the North Pacific Ocean. The name "Pacific Garbage Patch" has led many to believe that this area is a large and continuous patch of easily visible marine debris items such as bottles and other litter—akin to a literal island of trash that should be visible with satellite or aerial photographs. This is not the case. The patch is one of several oceanic regions where researchers have studied the effects and impact of plastic photodegradation in the neustonic layer of water. Unlike organic debris, which biodegrades, plastic disintegrates into ever smaller pieces while remaining a polymer (without changing chemically). This process continues down to the molecular level. Some plastics decompose within a year of entering the water, releasing potentially toxic chemicals such as bisphenol A, PCBs and derivatives of polystyrene. As the plastic flotsam photodegrades into smaller and smaller pieces, it concentrates in the upper water column. As it disintegrates, the pieces become small enough to be ingested by aquatic organisms that reside near the ocean's surface. Plastic may become concentrated in neuston, thereby entering the food chain. Disintegration means that much of the plastic is too small to be seen. In a 2001 study, researchers found concentrations of plastic particles at 334,721 pieces per km2 with a mean mass of 5.1 kg (11.3 lbs) per km2, in the neuston. The overall concentration of plastics was seven times greater than the concentration of zooplankton in many of the sampled areas. Samples collected deeper in the water column found much lower concentrations of plastic particles (primarily monofilament fishing line pieces). The United Nations Ocean Conference estimated that the oceans might contain more weight in plastics than fish by the year 2050. Some long-lasting plastics end up in the stomachs of marine animals. Plastic attracts seabirds and fish. When marine life consumes plastic allowing it to enter the food chain, this can lead to greater problems when species that have consumed plastic are then eaten by other predators. Affected species include sea turtles and the black-footed albatross. Midway Atoll receives substantial amounts of marine debris from the patch. Of the 1.5 million Laysan albatrosses that inhabit Midway Atoll, nearly all are likely to have plastic in their gastrointestinal tract. Approximately one-third of their chicks die, and many of those deaths are from plastic unwittingly fed to them by their parents. Twenty tons of plastic debris washes up on Midway every year with five tons ending up in the bellies of albatross chicks. Fish and whales may also mistake the plastic as a food source. On the microscopic level, debris can absorb organic pollutants from seawater, including PCBs, DDT and PAHs. Aside from toxic effects, some of these are mistaken by the endocrine system as estradiol, disrupting hormone levels in affected animals. These toxin-containing plastic pieces are also eaten by jellyfish, which are then eaten by fish and then by humans. Marine plastics facilitate the spread of invasive species that attach to floating plastic in one region and drift long distances to colonize other ecosystems. Debris affects at least 267 species worldwide. Increasing microplastic concentrations has released the insect Halobates sericeus from substrate limitation. A positive correlation between H. sericeus and microplastic was observed, along with increasing H. sericeus egg densities. ^ "World's largest collection of ocean garbage is twice the size of Texas". USA TODAY. Retrieved 29 April 2018. ^ a b www.theoceancleanup.com, The Ocean Cleanup. "The Great Pacific Garbage Patch – The Ocean Cleanup". The Ocean Cleanup. Retrieved 8 May 2018. ^ a b Lebreton, L.; Slat, B.; Ferrari, F.; Sainte-Rose, B.; Aitken, J.; Marthouse, R.; Hajbane, S.; Cunsolo, S.; Schwarz, A. (22 March 2018). "Evidence that the Great Pacific Garbage Patch is rapidly accumulating plastic". Scientific Reports. 8 (1): 4666. Bibcode:2018NatSR...8.4666L. doi:10.1038/s41598-018-22939-w. ISSN 2045-2322. PMC 5864935. PMID 29568057. ^ Lovett, Richard A. (2 March 2010). "Huge Garbage Patch Found in Atlantic Too". National Geographic News. National Geographic Society. ^ Victoria Gill (24 February 2010). "Plastic rubbish blights Atlantic Ocean". BBC. Retrieved 16 March 2010. ^ Day, Robert H.; Shaw, David G.; Ignell, Steven E. (1988). "The Quantitative Distribution and Characteristics of Neuston Plastic in the North Pacific Ocean, 1985-88. (Final Report to U.S. Department of Commerce, National Marine Fisheries Service, Auke Bay Laboratory. Auke Bay, Alaska)" (PDF). pp. 247–266. ^ a b c d Moore, Charles (November 2003). "Across the Pacific Ocean, plastics, plastics, everywhere". Natural History Magazine. ^ Berton, Justin (19 October 2007). "Continent-size toxic stew of plastic trash fouling swath of Pacific Ocean". San Francisco Chronicle. San Francisco: Hearst. pp. W–8. Retrieved 22 October 2007. ^ Yap, Britt (28 August 2008). "A raft made of junk crosses Pacific in 3 months". USA Today. Archived from the original on 30 September 2009. Retrieved 30 September 2009. ^ "Raft made of junk bottles crosses Pacific". msnbc. 28 August 2008. Archived from the original on 30 September 2009. Retrieved 30 September 2009. ^ Jeavans, Christine (20 August 2008). "Mid-ocean dinner date saves rower". BBC News. Archived from the original on 30 September 2009. Retrieved 30 September 2009. ^ Walsh, Bryan (1 August 2009). "Expedition Sets Sail to the Great Plastic Vortex". Time. Retrieved 2 August 2009. ^ "Scientists Find 'Great Pacific Ocean Garbage Patch'" (Press release). National Science Foundation. 27 August 2009. Archived from the original on 28 August 2009. Retrieved 8 August 2013. ^ "How the oceans can clean themselves – Boyan Slat at TEDxDelft". Retrieved 24 October 2012. ^ "Boyan Slat: The Marine Litter Extraction Project – TEDxDelft". 5 October 2012. Retrieved 24 October 2012. ^ a b "Boyan Slat – Marine Litter Extraction (In Depth)". Retrieved 24 October 2012. ^ "The Ocean Cleanup". Retrieved 24 October 2012. ^ a b Robarts, Stu (25 August 2015). "Ocean Cleanup project completes Great Pacific Garbage Patch research expedition". www.gizmag.com. Retrieved 25 August 2015. ^ Sea Education Association. "Plastics at SEA North Pacific Expedition". Retrieved 9 December 2012. ^ a b Goldstein, M. C.; Rosenberg, M.; Cheng, L. (2012). "Increased oceanic microplastic debris enhances oviposition in an endemic pelagic insect". Biology Letters. 8 (5): 817–20. doi:10.1098/rsbl.2012.0298. PMC 3440973. PMID 22573831. ^ "The garbage patch territory turns into a new state". United Nations Educational, Scientific and Cultural Organization. ^ "RIFIUTI DIVENTANO STATO, UNESCO RICONOSCE 'GARBAGE PATCH' – SITI – PATRIMONIO ITALIANO UNESCO". rivistasitiunesco.it. Archived from the original on 3 November 2014. ^ Where did the trash in the Great Pacific Garbage Patch come from? How do we stop it? ^ Lavars, Nick (17 October 2018). "Ocean Cleanup system installed and ready for work at the Great Pacific Garbage Patch". newatlas.com. Retrieved 21 October 2018. ^ Dent, Steve (11 September 2018). "A project to remove 88,000 tons of plastic from the Pacific has begun". engadget.com. ^ For this and what follows, see David M. Karl, "A Sea of Change: Biogeochemical Variability in the North Pacific Subtropical Gyre", Ecosystems, Vol. 2, No. 3 (May – Jun. 1999), pp. 181–214 and, for gyres generally, Sverdrup HU, Johnson MW, Fleming RH. 1946. The oceans, their physics, chemistry and general biology. New York: Prentice-Hall. ^ Eriksen, Marcus; Lebreton, Laurent C. M.; Carson, Henry S.; Thiel, Martin; Moore, Charles J.; Borerro, Jose C.; Galgani, Francois; Ryan, Peter G.; Reisser, Julia (10 December 2014). "Plastic Pollution in the World's Oceans: More than 5 Trillion Plastic Pieces Weighing over 250,000 Tons Afloat at Sea". PLOS One. 9 (12): e111913. Bibcode:2014PLoSO...9k1913E. doi:10.1371/journal.pone.0111913. ISSN 1932-6203. PMC 4262196. PMID 25494041. ^ a b Ferris, David (May – June 2009). "Message in a bottle". Sierra. San Francisco: Sierra Club. Retrieved 13 August 2009. ^ Faris, J.; Hart, K. (1994). "Seas of Debris: A Summary of the Third International Conference on Marine Debris". N.C. Sea Grant College Program and NOAA. ^ "Garbage Mass Is Growing in the Pacific". National Public Radio. 28 March 2008. ^ a b "Plastic pollution threatens to smother our planet". NewsComAu. Retrieved 21 July 2017. ^ Brassey, Dr Charlotte (16 July 2017). "A mission to the Pacific plastic patch". BBC News. Retrieved 21 July 2017. ^ a b Ryan, P. G.; Moore, C. J.; Van Franeker, J. A.; Moloney, C. L. (2009). "Monitoring the abundance of plastic debris in the marine environment". Philosophical Transactions of the Royal Society B: Biological Sciences. 364 (1526): 1999–2012. doi:10.1098/rstb.2008.0207. JSTOR 40485978. PMC 2873010. PMID 19528052. ^ "Oceanic "garbage patch" not nearly as big as portrayed in media – News & Research Communications – Oregon State University". oregonstate.edu. 4 January 2011. ^ Young, Lindsay C.; Vanderlip, Cynthia; Duffy, David C.; Afanasyev, Vsevolod; Shaffer, Scott A. (2009). Ropert-Coudert, Yan (ed.). "Bringing Home the Trash: Do Colony-Based Differences in Foraging Distribution Lead to Increased Plastic Ingestion in Laysan Albatrosses?". PLOS One. 4 (10): e7623. Bibcode:2009PLoSO...4.7623Y. doi:10.1371/journal.pone.0007623. PMC 2762601. PMID 19862322. ^ www.theoceancleanup.com, The Ocean Cleanup,. "The Exponential Increase of the Great Pacific Garbage Patch". The Ocean Cleanup. Retrieved 8 May 2018. ^ "What is the Great Pacific Garbage Patch?". National Ocean Service. Retrieved 25 August 2017. ^ Thompson, R. C.; Olsen, Y; Mitchell, RP; Davis, A; Rowland, SJ; John, AW; McGonigle, D; Russell, AE (2004). "Lost at Sea: Where is All the Plastic?". Science. 304 (5672): 838. doi:10.1126/science.1094559. PMID 15131299. ^ Barnes, D. K. A.; Galgani, F.; Thompson, R. C.; Barlaz, M. (2009). "Accumulation and fragmentation of plastic debris in global environments". Philosophical Transactions of the Royal Society B: Biological Sciences. 364 (1526): 1985–98. doi:10.1098/rstb.2008.0205. JSTOR 40485977. PMC 2873009. PMID 19528051. ^ Barry, Carolyn (20 August 2009). "Plastic Breaks Down in Ocean, After All – And Fast". National Geographic News. National Geographic Society. Retrieved 30 August 2009. ^ Moore, C.J; Moore, S.L; Leecaster, M.K; Weisberg, S.B (2001). "A Comparison of Plastic and Plankton in the North Pacific Central Gyre". Marine Pollution Bulletin. 42 (12): 1297–300. doi:10.1016/S0025-326X(01)00114-X. PMID 11827116. ^ Wright, Pam (6 June 2017). "UN Ocean Conference: Plastics Dumped In Oceans Could Outweigh Fish by 2050, Secretary-General Says". The Weather Channel. Retrieved 5 May 2018. ^ Holmes, Krissy (18 January 2014). "Harbour snow dumping dangerous to environment: biologist". CBC. ^ Gibbs, Susan E.; Salgado Kent, Chandra P.; Slat, Boyan; Morales, Damien; Fouda, Leila; Reisser, Julia (9 April 2019). "Cetacean sightings within the Great Pacific Garbage Patch". Marine Biodiversity. doi:10.1007/s12526-019-00952-0. ^ Chris Jordan (11 November 2009). "Midway: Message from the Gyre". Retrieved 13 November 2009. ^ "Q&A: Your Midway questions answered". BBC News. 28 March 2008. Retrieved 5 April 2010. ^ a b Moore, Charles (2 October 2002). "Great Pacific Garbage Patch". Santa Barbara News-Press. ^ "Rubbish haul found in stomach of dead whale". 27 October 2015. ^ "9 of 10 seabirds have swallowed plastic garbage — CBC News". ^ "Ocean plastic is the new DDT, Canadian scientist warns". CBC. 11 September 2015. ^ "Pacific sea birds dine on trash: researchers". CBC. 27 October 2009. ^ Hoare, Philip (30 March 2016). "Whales are starving – their stomachs full of our plastic waste". The Guardian. ^ Rios, Lorena M.; Moore, Charles; Jones, Patrick R. (2007). "Persistent organic pollutants carried by synthetic polymers in the ocean environment". Marine Pollution Bulletin. 54 (8): 1230–7. doi:10.1016/j.marpolbul.2007.03.022. PMID 17532349. ^ Tanabe, Shinsuke; Watanabe, Mafumi; Minh, Tu Binh; Kunisue, Tatsuya; Nakanishi, Shigeyuki; Ono, Hitoshi; Tanaka, Hiroyuki (2004). "PCDDs, PCDFs, and Coplanar PCBs in Albatross from the North Pacific and Southern Oceans: Levels, Patterns, and Toxicological Implications". Environmental Science & Technology. 38 (2): 403–13. Bibcode:2004EnST...38..403T. doi:10.1021/es034966x. PMID 14750714. ^ Rogers, Paul (1 September 2009). "'Pacific Garbage Patch' expedition finds plastic, plastic everywhere". The Mercury News. Retrieved 4 October 2009. ^ Allsopp, Michelle; Walters, Adam; Santillo, David; Johnston, Paul (2007). Plastic Debris in the World's Oceans (PDF) (Report). Greenpeace. Oliver J. Dameron; Michael Parke; Mark A. Albins; Russell Brainard (April 2007). "Marine debris accumulation in the Northwestern Hawaiian Islands: An examination of rates and processes". Marine Pollution Bulletin. 54 (4): 423–433. doi:10.1016/j.marpolbul.2006.11.019. PMID 17217968. Rei Yamashita; Atsushi Tanimura (2007). "Floating plastic in the Kuroshio Current area, western North Pacific Ocean". Marine Pollution Bulletin. 54 (4): 485–488. doi:10.1016/j.marpolbul.2006.11.012. PMID 17275038. Masahisa Kubota; Katsumi Takayama; Noriyuki Horii (2000). "Movement and accumulation of floating marine debris simulated by surface currents derived from satellite data" (PDF). School of Marine Science and Technology, Tokai University. Gregory, M.R. ; Ryan, P.G. (1997). "Pelagic plastics and other seaborne persistent synthetic debris: a review of Southern Hemisphere perspectives". In Coe, J.M. ; Rogers, D.B. (eds.). Marine Debris: Sources, Impacts, Solutions. New York: Springer-Verlag. pp. 49–66. Moore, Charles G.; Phillips, Cassandra (2011). Plastic Ocean. Penguin Group. ISBN 9781452601465. H. Day, Robert; Shaw, David; E. Ignell, Steven (1 January 1990). "The quantitative distribution and characteristics of neuston plastic in the North Pacific Ocean, 19841988" (PDF). Morton, Thomas (2007). "Oh, This is Great, Humans Have Finally Ruined the Ocean". Vice magazine. pp. 78–81. Archived from the original on 4 July 2008. Hohn, Donovan (2011). Moby-Duck: The True Story of 28,800 Bath Toys Lost at Sea. Viking. ISBN 978-0-670-02219-9. Hoshaw, Lindsey (9 November 2009). "Afloat in the Ocean, Expanding Islands of Trash". The New York Times. Retrieved 10 November 2009. Newman, Patricia (1 April 2014). Plastic, Ahoy! : Investigating the Great Pacific Garbage Patch. Millbrook Press. ISBN 9781467725415. Wikimedia Commons has media related to Great Pacific Garbage Patch. By 2050, the oceans could have more plastic than fish. Business Insider. 27 January 2017. The Ocean Cleanup. "Scientific publications". Retrieved 21 October 2018. Dunning, Brian (16 December 2008). "Skeptoid #132: The Sargasso Sea and the Pacific Garbage Patch". Skeptoid.